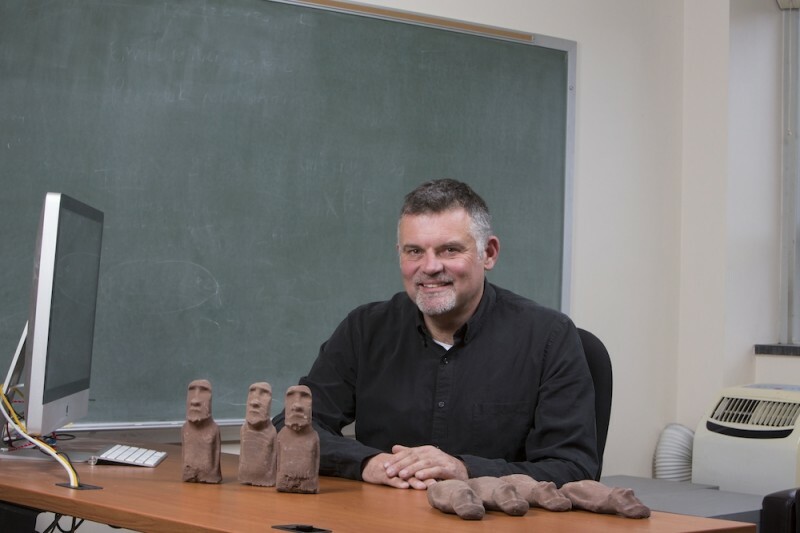 Binghamton University archaelogist Carl Lipo is working to uncover the ancient mysteries of Rapa Nui (Easter Island, Chile). Image Credit: Binghamton University, State University of New York. Binghamton University archaelogist Carl Lipo is working to uncover the ancient mysteries of Rapa Nui (Easter Island, Chile). Photography: Binghamton University, State University of New York. BINGHAMTON, N.Y. – The ancient people of Rapa Nui (Easter Island, Chile) built their famous ahu monuments near coastal freshwater sources, according to a team of researchers including faculty at Binghamton University, State University of New York. The island of Rapa Nui is well-known for its elaborate ritual architecture, particularly its numerous statues (moai) and the monumental platforms that supported them (ahu.) Researchers have long wondered why ancient people built these monuments in their respective locations around the island, considering how much time and energy was required to construct them. A team of researchers including Binghamton University anthropologist Carl Lipo used quantitative spatial modeling to explore the potential relations between ahu construction locations and subsistence resources, namely, rock mulch agricultural gardens, marine resources, and freshwater sources—the three most critical resources on Rapa Nui. Their results suggest that ahu locations are explained by their proximity to the island’s limited freshwater sources. The paper, “Rapa Nui (Easter Island) monument locations explained by freshwater sources,” was published in PLOS ONE.